The past stays in the past..."
The joy of hearing and seeing live music is one thing, but to encase it all in the relatively cramped setting of a home that is slated for destruction adds an arty cool to the whole thing. The creation/destruction parallels push this a few notches up from being a standard concert disc, and there appears to be a great community feel amongst the acts. 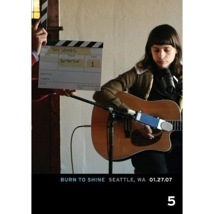 Once again directed by Christoph Green, Burn To Shine: Seattle, WA utilizes a number of cameras to catch the performers from different angles, including sometimes from outside a window looking in. And the end result are intimate and up-close performances that clearly reveal all of the small details that make watching an artist create intelligent, heartfelt music live such a thrill. The big names here are Pearl Jam's Eddie Vedder and Death Cab/Postal Service frontman Ben Gibbard, each of whom contribute a performance. Vedder does a brazen solo rendition of Can't Keep, and while maybe not the first song I would have wanted to have him select, it's transformed into a forlorn piece that features the conceptually appropriate line "you can't keep me here". Fitting for a locale about to be destroyed. As for Gibbard, who sports a very bushy beard, his lovely take on Broken Yolk In A Western Sky proves why he's the guy with "that voice" that makes all the young hipsters hang on every word he sings. I'd categorize Harvey Danger as a "name" act, but that's probably not wholly accurate. They're big in my house, and their spirited Little Round Mirrors, complete with a brief GNR/Paradise City break in the middle, reiterates why the Little By Little release was probably my favorite disc of 2006. The lyrics are wry and cynical, delivered with a great degree of passion by vocalist Sean Nelson. Ditto for DVD covergirl Jesy Fortino (aka Tiny Vipers), whose stark acoustic performance of On This Side shows an artist with a scary kind of intensity, as if we're hearing deep, dark secrets from her diary. Fortino/Tiny Vipers is the poster child for what Burn To Shine should bring to the table—raw, emotional live music. There are no real dead spots here, and while I'm not necessarily a fan of the more urban DJ approach of Blue Scholars I know it's part of representing the local flavor, which is the all-important mantra of Burn To Shine. Dave Bazan (Pedro The Lion), The Long Winters and Minus The Bear are college radio staples, and the hypnotically odd stylings of The Cave Singers showcase the type of groovy, adventurous music that this series is all about. Image Transfer Review: Released in a nice looking 1.78:1 anamorphic widescreen transfer, Trixie has once again come through with a clean, strong video presentation. Colors tend to run into being predominantly gold and red, but the level of detail (especially on all that hip and trendy facial hair) is sharp and well-defined throughout. I noticed a bit of shimmer and ringing in some spots, but very minimal. Audio Transfer Review: The sole audio track is 2.0 PCM, and the mix provides enough deep bass and clean highs to possibly make one forget that this wall all recorded live, with no overdubs. Even with an assortment of musical styles, the PCM track remains distortion free, rendering the acoustic nuances of Tiny Vipers' Jesy Fortino clearly, while more electric performances, such as The Long Winters, comes across equally well. Extras Review: The bonus bit is a slideshow (03m:15s), featuring a number of candid anamorphic color photos shot during the day of shooting. The disc itself is cut into 16 chapters, with 14 of those being musical performances. Another standout entry in Trixie's Burn To Shine series, this time featuring fourteen Seattle-area artists, each performing one song live in a house that is set to be destroyed. And while alt-hero Ben Gibbard (Death Cab, Postal Service, etc) and Pearl Jam leader Eddie Vedder are the marquee names, it is all the other performances from groups that maybe aren't as well known—Tiny Vipers, Harvey Danger and The Cave Singers especially—that give this disc those a number of its very best moments. Rock on, indeed. Highly recommended.